JCESR is an intellectual leader in the scientific community, both as an initiator and as a participant in leading energy storage conferences worldwide. Recognizing the importance of lithium sulfur to transform the current battery landscape, JCESR, with OXIS Energy and Imperial College London, initiated the Li-SM3 Conference in 2016, providing a forum for international collaboration on this transformative energy storage opportunity. In addition, JCESR members participate in many scientific conferences and regional events throughout the year in a leadership position. The Li-SM3 Conference was initiated in 2016 as the first international conference on lithium sulfur batteries. For the first time since its inception, JCESR hosted the conference in the U.S. in April 2018. Each year, a different country is selected to host this meeting. In 2018, JCESR was proud to host the first U.S. Li-SM3 conference in Chicago. Next year’s conference will be held in Beijing. Each year, JCESR researchers participate in many energy storage conferences where we are invited speakers, session moderators, and presenters. Recent notable conferences include the Materials Research Society Meetings in both fall and spring; the Electrochemical Society Meetings in fall and spring; the Advanced Automotive Battery Conference, fall and spring; and the annual Beyond-Lithium-ion Symposium. JCESR has organized nine regional events spanning the entire U.S. At these events, we engage local universities, industry, and other institutions to discuss the challenges facing the region. For example, in Mississippi, we discussed the ways energy storage can help build a more resilient grid after the devastating effects of hurricane Katrina. While in California, we discussed electric vehicles, and in Texas, we discussed the ways to best store energy from the many wind farms in the region. 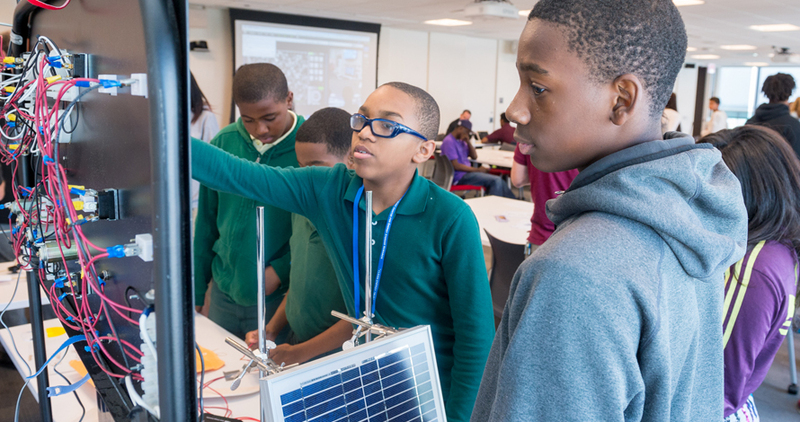 We also held educational outreach events with high school students to give them a hands-on opportunity to build a real working battery while learning from the JCESR team the many opportunities available in science and engineering. The JCESR “Charging up the Classroom” event gave local students the chance to learn about opportunities in science.